CARLSBAD — On the afternoon of April 29, the city of Carlsbad joined an elite list that includes the Statue of Liberty, the Golden Gate Bridge and Darth Vader. At the unveiling, Carlton Lund, a Carlsbad resident since 1972, presented the Carlsbad Education Foundation with a check for $20,000. “What’s neat is for me is it’s a personal thing,” Lund said. “From the start of the journey and seeing it become a part of the park. 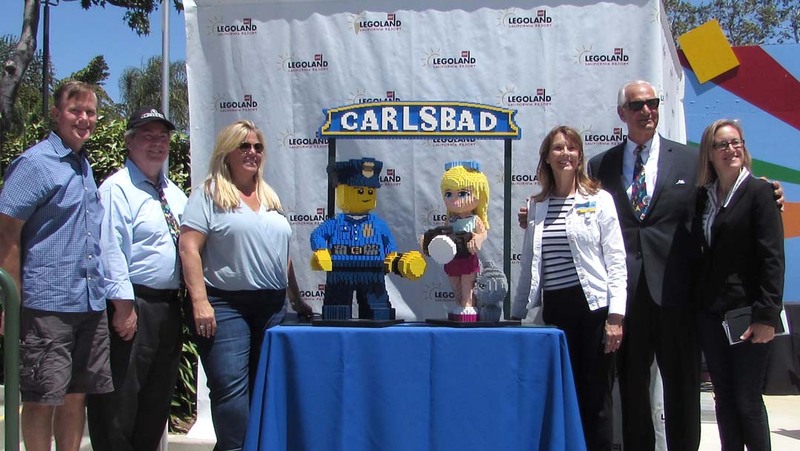 The immortality of having the Carlsbad sign [LEGO’ed] — it’s special for the kids, and special for the parents.” Lund said he feels that the mainstream exposure gained from the new LEGO sign will also benefit local businesses. For some, fame isn’t fame until it’s LEGO fame. And a lot of work goes into the design of structures both big and small. “The new LEGO Carlsbad sign contains nearly 5,000 LEGO elements,” Estrada said. “That may sound like a lot, but consider this: There are more than 30,000 LEGO models in the park created from more than 62 million LEGO bricks.” The park’s models range in scope from a 2-million-piece brontosaurus, to a four-piece rabbit. The LEGO Carlsbad sign’s permanent location is still being determined. “We’ll be exploring our options for the new sign after the unveiling,” Estrada said.